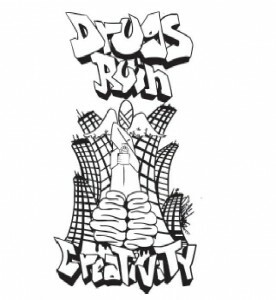 The original design of LA artist, Jose Quevedo, is now featured on the “Drugs Ruin Creativity” T-shirt. Find local businesses to sponsor kids wearing it to promote drug-free living. Artist, Jose Quevedo, interprets his powerful design. Keep an eye out for these shirts! We want them everywhere! This entry was posted on Thursday, March 31st, 2011 at 2:56 pm	and is filed under Drug Abuse, Drug Prevention, Drugs in the Community. You can follow any responses to this entry through the RSS 2.0 feed. Both comments and pings are currently closed.